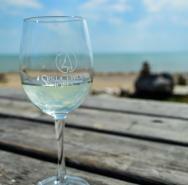 The Mitchell family welcomes you to sample handcrafted 100% VQA wines at their lakefront destination winery. Situated on 52 acres of land, the retail centre is a beautiful Tuscany style "old world" building with extensive balconies that overlook breathtaking views of both the vineyard and Lake Erie. Enjoy a glass of wine as you observe various artworks, relax on the balcony or stroll along their beachfront.